In medieval times, I read, the time of greatest hunger was the most cruel: it happened in early summer, while the crops were still growing, trees were flowering, but the larders were empty from last year. Peasants could see the future and what was left of the past. The present, though, was bleak. The shelves at the Weston Area Emergency Support are bare, and they could use your support. I always recommend donating money rather than goods, though I am assured that both are welcomed. Nobody wants hotdogs with no buns, however, and money lets food banks buy what they need, often at a discount over what you might pay. Aaron D’Andrea wrote an excellent article for InsideToronto on the tiny Weston food bank. It’s well worth a read. The food bank, located in the back of the Frontlines building at 1844 Weston Rd. near Lawrence Avenue West, is only open for clients on Tuesdays during the summer (July and August), but its volunteers, mostly from Toronto’s Weston neighbourhood, come in throughout the week to help out. The VCCU is accepting donations for the food bank, should you feel inclined to help. 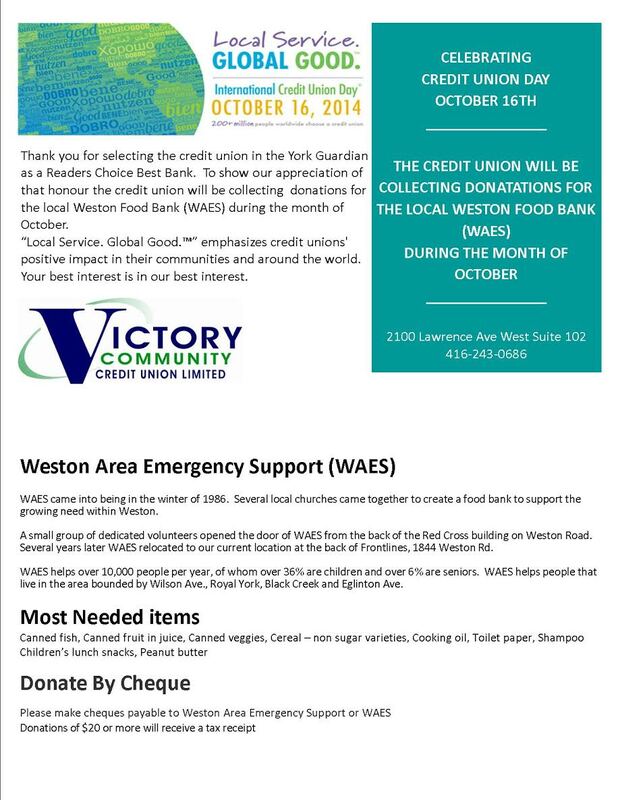 The Victory Community Credit Union is raising money for the Weston Food Bank, whose “cupboards are bare”, according to the VCCU. You can stop by the VCCU with non-perishables or to donate cash (and may I suggest cash, so the food bank can match hotdogs with buns?). The best time to give is after you feel like hell for being such a crass and grasping consumer and before your credit card bill comes due. That should be in about two weeks, if your experience (and postal service) is like mine. Me, I like to give money. It’s less trouble, and nobody ends up with peanut butter but no jam. You can donate directly to WAES. Frontlines is a popular youth after-school drop-in centre. They’d be glad for a little of your dough. The WKNC does great work, too, I know. They are a drop-in and outreach centre. They’re always busy. A little cash would go far in their hands. Add your favourite charity in the comments. I’ll link to them. The Weston food bank is feeling a little pinched, according to InsideToronto. At the same time, he added, the number of residents who are reliant on its drop-in breakfast, lunch, and community dinners are steadily increasing from about 65 to 100 people daily. As an amateur economist, can I encourage you, if you feel so inclined, to give cash instead of cans? Nobody likes hotdogs without buns. Thanksgiving is the most profound time of the year–both melancholy and joyful, with the end of summer and the bounty of harvest; it is time to reflect on what came before and what is yet to come. Or maybe I’m feeling melancholy because it’s my birthday. The Farmers’ Market is having a harvest celebration this weekend. There will be face painting, castles, and an unusual fashion show. To honour the season, our local food bank and the Weston Park Baptist Church will be raising money and starting a food drive. The drive will begin in earnest on December 6, but they would be very glad to accept a donation now. This weekend is the best weekend of the year. It’s the weekend my family always gets together to celebrate birthdays and Thanksgiving and the changing of the seasons, and even though we are thoroughgoing atheists, we give a little shout-out to the universe for all its many blessings. If, like me, you have a lot to be thankful for, I hope you’ll consider passing along some of your good fortune to the Weston Area Emergency Support. At least three local organizations are supporting the WAES: the Victory Community Credit Union, Central United Church, and Weston Memorial school. You can also give online. You can drop off your donations, or cheques, at the VCCU.